You surely know what are major chords, minor chords, seventh chords and diminished 7th chords ? 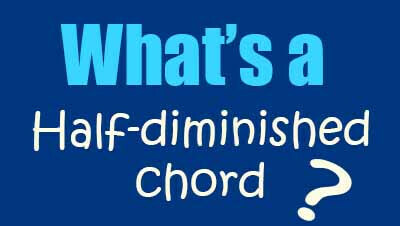 But you may be wondering what half-diminished chords are ? In music, the most encountered chords are major and minor chords. These are the basis of the Harmony. Seventh chords (m7, Maj7 and dom7) are also widely used, particularly in jazz and blues music. 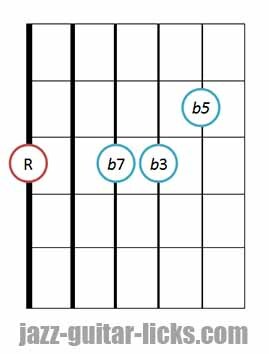 When a guitar student start to take an interest in jazz, he can sometimes find chords with a little barbaric names such as diminished 7th chords, augmented or even half-diminished chords (m7b5). 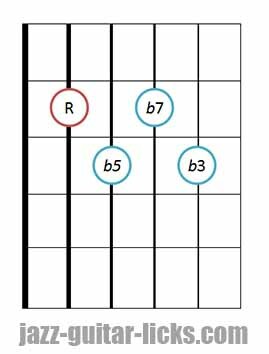 This article will explain you what are m7b5 chords, how to play them on the guitar and how to apply them in common harmonic contexts as major and minor II-V-I progressions. What is a Half-diminished Chord? 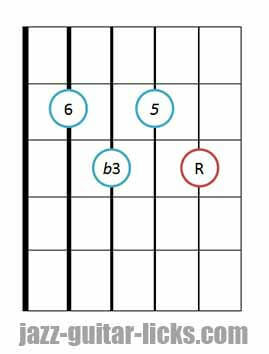 Minor 7 flat 5 chord is close to a diminished 7th chord, the first 3 notes are identical, but the 4th is different. This chord can be written in two ways: m7b5 or Ø. If you do not know how to play and what is a diminished 7th chord, you can read this page about diminished chord voicings. As is it shown in the chart below, the half-diminished chord is built with a root (1), a minor third (b3), a flat fifth (b5) and a minor 7th (b7). The diminished 7th chord has a diminished 7th instead of the minor seventh. This is the only difference between these two chords. You can find the half-diminished chord in a number of harmonized scales. For example the 7th degree of the major scale, the 2nd degree of the harmonic minor scale and the 6th and 7th degree of the melodic minor scale. When you harmonize in thirds the degree VII of the major scale you obtain a m7b5 chord. When you harmonize in thirds the degree II of the harmonic minor scale you get a m7b5 chord. When you harmonize in thirds the degrees VI and VII of the major scale you obtain two m7b5 chords. 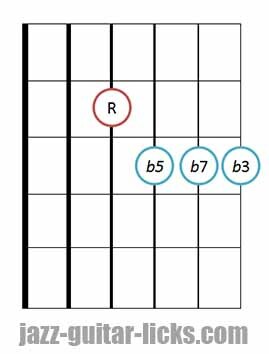 Here are three main positions to play a m7b5 chord on the guitar. 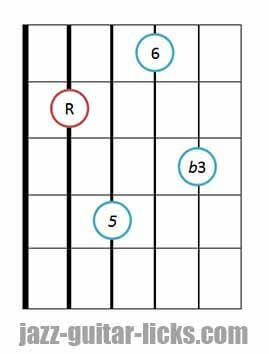 You can visit this page for more half-diminished guitar chord positions. The m7b5 chord can be found in different contexts and is used in different substitutions. For example, when playing a minor II V I progression, the 2nd degree is a m7b5. The half-diminished chord is specially a leading chord, the sound strongly pulls towards resolution. It is possible to use it as a diatonic substitution for a dominant 7th chord. Try to play the m7b5 a major 3rd higher than the dominant 7 chord to replace it. For example, use Bm7b5 for G7. You can use the m7b5 as a substitution for a minor 7th chord, built from a minor third below. Meaning, you can replace Cm7 chord with an Am7b5. The minor seventh flat five chord is also an inversion of the minor 6 chord. This is a minor 6 chord with the sixth in the bass. Here is a comparison between them. Drop 2 half-diminished guitar chord diagram.